Blues guitarist and singer Freddie King was born and raised near Gilmer, Texas, spent his final years in Dallas, and his nickname was the Texas Cannonball. But between 1950 and 1963 he lived and worked in Chicago, and it's this period upon which his massive reputation rests. The point is underlined in Bill Dahl's liner notes for the recent The Complete King Federal Singles (Real Gone Music), a sprawling double CD that contains most of King's greatest output, including his ubiquitous, eternal instrumental "Hide Away." That virtuosic classic, which reached #5 on Billboard's R&B chart and #29 on the pop charts, was an expert collage of sources, according to Dahl's notes. The quote from Henry Mancini's Peter Gunn theme was always obvious, but I'd never connected the ultra-raw Hound Dog Taylor classic "Taylor's Boogie"—which he didn't record himself until it appeared as "55th Street Boogie" on his 1971 debut for Alligator, Hound Dog Taylor & the Houserockers—nor the Magic Sam instrumental "Do the Camel Walk" as the key source for King's melodic line. Another part of the song was swiped from the Jimmy McCracklin classic "The Walk." In fact, what becomes clear after reading the notes is that King's forte wasn't songwriting, even though he's co-credited on most of the tracks in this 54-track set. According to the notes, King Federal producer Sonny Thompson would sit down with the guitarist in the studio and they would write material piecemeal. "And Sonny would say, 'Now play this here, play that there. This would sound better if you do this here,' said [bassist Bill] Willis. "Freddy was agreeable to most stuff." In the end, however, it didn't much matter; his remarkable instrumental skills, energy, and crispness, to say nothing of his passionate, soulful singing, transformed even the most subpar material into something special. His playing was a key influence on a crop of blues-rock heavies from Eric Clapton to Stevie Ray Vaughan (although I refuse to hold that against King), and even at his most virtuosic and fiery, he maintained an impressive clarity and tunefulness. As a youngster in Chicago, King was an early admirer of guitarists Jimmy Rogers, Eddie Taylor, and Robert Jr. Lockwood, and he was eventually introduced to King's Sonny Thompson by soul great Syl Johnson (who, with time, seems to be somehow connected to every soul and blues career in Chicago during the late 50s and 60s). King recorded the bulk of this material in concentrated bursts between 1960 and 1964, with a handful of tunes recorded over the next two years, yet after a flurry of hits in 1961—landing seven songs on the R&B charts—he never again landed there at King Federal nor any of the other imprints he subsequently worked for. By the 70s King had lost most of his inspiration and it showed in his lackluster recordings of the time. He died in 1976 from complications of stomach ulcers and acute pancreatitis. He was only 42. Below you can hear "Sittin' on the Boat Dock," another gem from the set—this one showcasing his voice—that was penned by Thompson. It bears more than a passing resemblance to the Lee Dorsey classic "Ya Ya." 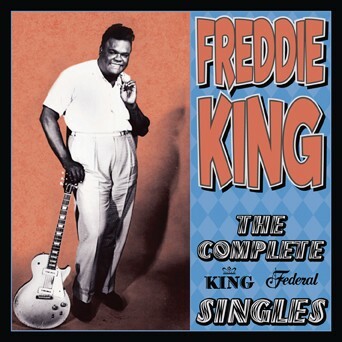 Freddie King, "Sittin' on the Boat Dock"